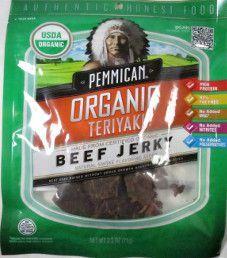 The first review on the Pemmican brand of jerky will focus on a 2.5 ounce/71 gram bag of their teriyaki flavored organic beef jerky. Worth noting is that the actual jerky weight is only 67 grams. This bag was purchased at a Harris Teeter store located in Virginia Beach, Virginia. 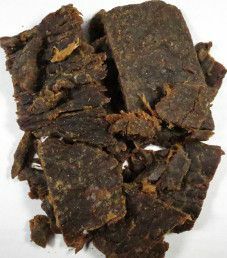 The Pemmican jerky brand name is manufactured and distributed by Marfood USA, located in Taylor, Michigan. Marfood USA claims to be the largest distributor of jerky in North America, which may very well be true. More often, you see Marfood USA act as both a distributor and private labeler for over 100 various jerky brands. Traditionally, pemmican is a style of dried beef created by Native American Indians. It is a mixture of cooked, dried, and a shredded type of meat, combined with melted fat. The highest standard of beef would be organic beef. That implies that the cattle are ethically raised, meaning no growth hormones or additional antibiotics are administered. There would also be at least some partial free range access to graze on grass. The liquid marinade is comprised of organic soy sauce and healthy organic vinegar. Being organic based liquids, they are both excellent choices. 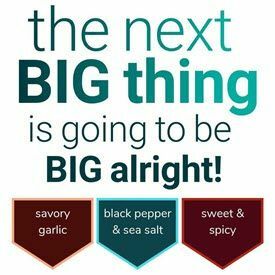 There are several healthy spices and vegetables used such as organic onion powder, organic black pepper, organic ginger, and organic paprika. The sugar level is somewhat high at 5 grams of sugar per 28 grams of jerky. While our preference is 3 grams of sugar or less, that is negated to a certain extent because organic based sugars are used. The salt level is very high at 570mg of salt per 28 grams of jerky, where our preference would be 350mg of salt or less. However, that is somewhat negated because minimally processed sea salt is partially used, which is high on essential minerals and trace minerals. This jerky does qualify to be sodium nitrite free, or use any other unhealthy preservatives. Apart from salt, celery powder is the main preservative used with its naturally occurring nitrates. Admirably, this jerky does qualify to have no MSG added. These strips of jerky are a mixture of medium and small sized, and sliced to a medium thickness. They have a dry texture that is relatively easy to chew. There are no visible signs of fat, and handling this jerky leaves no oily residue on your fingers. The first taste detected is a moderate soy flavor. There is a mild tang from the vinegar, and it is moderately salty tasting. The sweetness is mild tasting, which allows a good deal of natural beef flavor to be present. There is a good mild combination of garlic and onion flavor. To round off the flavor, there are light peppered and paprika tastes. Overall, while this flavor tastes good, there is not much of a teriyaki based flavor apart from the soy taste. This flavor more resembles an original flavor. This 2.5 ounce/71 gram bag of jerky was purchased for $5.99. That works out to $2.40 an ounce, which rates as an expensive price. Given that organic beef is used, this is more of an average to cheap price. This jerky is recommended as worth your money. This bag has everything printed directly on the bag, both the front and back. Once exception is a sticker affixed to the back that displays the nutrition facts table. Their logo is a fairly high resolution picture of an Indian, which is fitting given the history of pemmican. Their slogan is “Authentic Honest Food”. Some facts printed on this bag are “High Protein”, “97% Fat Free”, “No MSG Added”, “No Added Nitrates”, “No Added Preservatives”, “Made From Certified Organic”, Natural Smoke Flavoring Added”, and “Beef Used Raised Without Added Growth Hormones or Antibiotics”. All bag categories are covered with this bag. 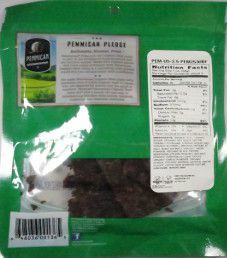 On the back, there is a blurb printed about this jerky about “The Pemmican Pledge”. Some other things displayed are a QR code, USDA Organic stamp, and their Facebook page details.